Yesterday it was low 30s in London. Today it is 20, and not expected to get above 24. Normal summer temperatures at last!!! I doubt that anyone has missed me, but here I am. I have preordered the new Yoko Ono and Paul McCartney albums, and I have just received my copy of the new compilation from Bob Dylan's copyright collection. We are going to see Bob Dylan in October when he comes to our area. I recently bought a nice little Beatles box set of bootlegs called Abbey Road and Beyond. I had some of the material but it was nice to have it in other than mp3 format. This morning I watched the Albert Maysles documentary, "The Love We Make," about Paul McCartney 's involvement in the Concert for New York City following the 9/11 attack. It made me miss the way our country was before 9/11. Good to see you again, @Expert Textpert. I found out this week I likely have the beginning of osteoarthritis in my knees. The joys of being over 40. Currently listening to The Byrds, Younger Than Yesterday . My friend bought me most of their albums recently. After two years of using the free music notation program Musescore, I got Sibelius the other day. $150 I'm never seeing again, as far as I'm concerned. Not only was it like trying to smuggle a gun through an airport when trying to pass the security checks, it is simply inferior to Musescore. There are instrument sounds that are better on both programs, but more sounds are better on Musescore than Sibelius. It takes 14 hours to do anything in Sibelius because it has way too many menus and sub-menus. But the final straw is that it can't even crescendo/diminuendo over one note. (And I'm sure I haven't found even 10% of the problems with it). 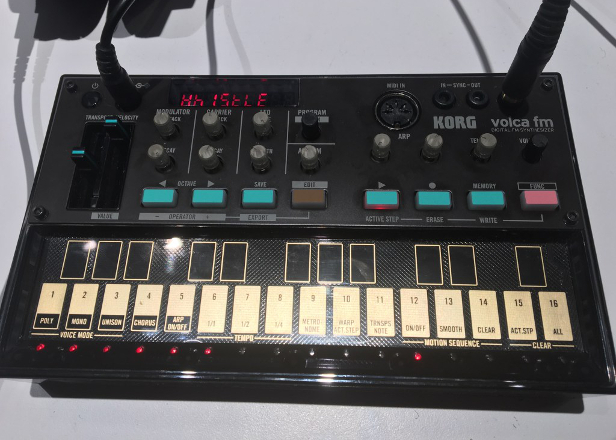 Speaking of, a week ago or so, I just purchased myself a KORG Volca FM Synthesizer (it's the little thingamajig below). Definitely hoping to get my $220 worth of it and hopefully turn it into a profit with lots of time. To Conclude, I am trying to make the best of it and loving my life. I hope all of you are also having amazing days, because what's the other option? I'm planning my trip to London with my friends at the beginning of September- so far I have tickets booked for The Book of Mormon, Harry Potter and the Cursed Child, Harry Potter studios, and Matilda. I'm a big history dork (as I've said before) so I want to go to the National History Museum, the V&A, the British Museum, and the British Library but I'm not sure if my mates will be up to going to so many history places. I'd love to go to the Tower of London, and Churchill's War Rooms as well but I don't know if I'll be able to fit them in. Any other recommendations? I know I have a few Potter, and Beatle ones already mentioned by the lovely Joe and RN but anything else to prove to my friends that I can actually have a good time and not be an old historical bore. @NickCanadaCore Cool to hear. I'm somewhat interested in getting into the music business myself. @appllescruffjunior Geez, can I travel with you? Your itinerary sound absolutely gear. I am finished with my summer job. I didna lotnof awesome Mountain Biking and had tons of fun, despite some down moments in the summer. Yay! Glad to have you back @sir walter raleigh! Welcome back, @sir walter raleigh! Welcome, @sir walter raleigh and I hope you had a great time! Haha, I would love to be mistaken as a boy, androgony is the best, but sadly I’m too attached to my hair to cut it. However, I’m shopping for a suit to wear on the first day of school later this week. Whee! I’m gonna dress like a guuuy. I have four days off work. It's currently cold, wet and windy - how is that better than 29° and roasting sunshine every day and night? And don't go quoting no 'Mamunia' at me. Talking in celcius as in the wonderful sensible Scotland and not in a country that uses fahrenheit for their standards.